The notion of an ‘Olympic Legacy’ is often invoked to reiterate the longevity and importance of the global sporting event. The prestige of the games and celebrity of the athletes lodge in the imagination of the audience, promising a summer of sporting celebration that will aim to inspire a new generation of athletes and encourage even the laziest of us to take up a new sport. 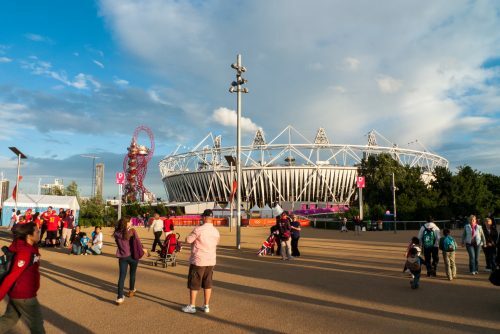 However, whilst sport seems the most obvious of Olympic legacies, it would seem that in the long term, cultural projects running alongside the Olympic Games provide another layer of continuity. In fact cultural legacies have the potential to be more lucrative and therefore the more enduring. It is perhaps a little known fact that the Olympics Games historically included competition for the arts; medals were awarded for pieces inspired by sport in the categories of architecture, literature, music, painting and sculpture. It had been the vision of Pierre de Coubertin, founder of the International Olympic Committee, to celebrate achievements of both the body and mind in the modern age of the Olympics, beginning in 1912. However, these competitions were eventually stopped after the 1948 Olympics, primarily as a result of the ban on professional entries which compromised the quality of the work. Currently, Cultural Olympiads run in tandem with each Games as festival and exhibition projects. Although these cultural events are typically sidelined in favour of sport, it may be seen that the cultural impact and significance of each Olympic Games overshadows the sporting element when the competition is over. A particular case we may examine with regards to legacy is the London 2012 Olympics. In its evaluation of the impact and legacy of both the Olympic and Paralympic Games, the Department for Culture, Media and Sport reported that a year after the Olympics, the proportion of adults participating in at least 30 minutes of moderate exercise once a week had increased by 3.5% in 2012 since 2005/6. Indeed, we may trace a general upwards trend in the number of adults participating in exercise over the last decade; but is difficult to know how far this success can be apportioned to the Olympic Games in the UK. Knowledge of the benefits of exercise is increasing, as are obsessions with healthier lifestyles which are perpetuated by social media. Moreover, although the rate of participation in exercise has increased (perhaps with the growing popularity of gyms), the number of adults taking up particular sports has fallen steadily. Last summer it was reported that ‘220,000 fewer people did sport of any kind in the previous six months’. The drop implies a stagnating Olympic legacy, as opposed to the boom in sporting participation that was originally hoped for . Team sports and competitive disciplines, such as athletics, have been lauded as beneficial to mental health, social well-being and community cohesion; arguably gym usage cannot offer these advantages. Whilst some may argue that it is more important that the population is participating in exercise regardless of the method, it is pertinent to suggest that the particular legacy of the Olympics should be to inspire people towards an interest in sports seen in the Games. In contrast, the cultural legacy of London 2012 looks to have a greater impact in the coming years. Plans to transform the Olympic site in East London into a cultural hub (dubbed ‘Olympicopolis’ by London mayor Boris Johnson) include ‘a Sadler’s Wells dance theatre, a second exhibition space for the Victoria & Albert Museum and extra university campuses for UCL and the University of Arts London, dedicated to art, design and engineering.’ Last November, it was reported that private investors had pledged £45 million to the plans, in addition to the £141 million of public money pledged by George Osbourne in 2014. It is easy to understand the attraction for international developers and businesses; involvement in this project in a prime area of London is an appealing prospect. The commitment to developing the cultural legacy of the Olympic site threatens to overshadow the sporting achievement we predominantly associate with the Olympic Games. It appears to have proven a more lucrative prospect for future investment and development. The cultural legacy of the Olympic Games is undoubtedly important in its own right, especially in today’s climate of economic austerity where funding to the arts is often the first to be cut, but it is important that the legacy of sport not be overlooked. Despite the aforementioned growth in healthy living interest, levels of obesity and weight-related illness in the UK continue to rise. This suggests that more of an effort must be made to capitalise on the sporting enthusiasm garnered by the Olympic Games. With every four years comes a new promise to inspire greater involvement in sport, but we must overcome this evident pattern of stagnation in sporting participation to truly ensure a lasting Olympic legacy.